Close your eyes; clear your heart. Cut the cord. I have, in the past, been called intimidating. I don’t think it was an insult, rather a suggestion that I’m a confident person who knows their own mind and won’t take any nonsense. So why, in the past few weeks, have I found myself quaking with fear, overcome with an anxiety so deep that I could barely move? The opportunity to come away to France for a while and learn how to ski came up and I was looking forward to it. It could maybe help my running – descending is a weakness – and it looked like fun! So many people told me I would love it. So many people do it. Why not me? We bought all the gear, booked a weeks’ worth of lessons and got on with it. Time to face the first fear of actually getting up the mountain. There’s no rational reason behind my fear of heights, yet cable cars and chair lifts make me feel sick. But, I felt the fear and did it anyway. That’s the advice isn’t it? I can now go up on my own without shaking and deep breathing! The lessons were great. We didn’t do anything too scary; the instructor was exceptionally chilled out and I definitely improved. There were a couple of wobbles but I came back the next day and got over them. Time to try a blue run. Jayson – hubbie – and Eddie – super running coach – got me down a long, swoopy, wooded run. It was slow, but I stayed upright. My legs were destroyed by the end, but I did it! The next day, I did another: twice! The snow was deep and slow which was perfect for me, and I felt like I’d turned a corner. Jayson and me having a nice time skiing uphill! The next day, I hit a roadblock. Attempting a new blue turned out to be a step too far. The snow was hard and icy, so I was going much faster. I managed five times without a sense of control, before I finally lost any control and skidded over. I had to walk down the run, sit at the bottom and have a bit of a cry. We decided that I needed a green to warm up first and that ice was not my friend! Then, I experienced something like never before. After trying a button lift for the first time and starting down a pretty steep section of green, I had what I think must have been a panic attack. I couldn’t breathe; I was sobbing so much it almost sounded like laughter and then I got so dizzy that I had to sit down. We tottered down but I had had enough. That whole fortnight got me thinking about fear. 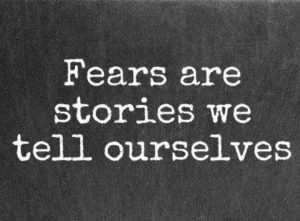 Fear isn’t a tangible thing, but a thought. It is just your brain projecting into the future or reliving the past. It is imagining something that doesn’t actually exist, or hasn’t actually happened. Of course, we need some fear to help us stay alive, otherwise we’d all just be walking out into traffic or getting eaten by wild animals. But why does it affect us in so many different ways? Why do some people feel the fear, do it anyway and get the adrenaline rush, and why does it stop others in their tracks? Running ultras is something that has never scared me. When I found out about them, the idea excited me. I wanted to see if I could push myself that far, to do something extraordinary. I can completely understand how ultras terrify some people – they are madness when you think about it – but why not me? Maybe the key is the build up, the practice. After running for years, I could understand the ‘how’ of an ultra. Never having thrown myself down a snowy mountain on two sticks in the past could have something to do with my newfound fear. So why should we even do things that scare us? It’s not an enjoyable feeling. Surely it would be easier just to stop doing the thing that scares us. Of course, some scary things will never bring us pleasure. There’s no point forcing yourself to do something that truly terrifies you to your core. But, where would we be if we didn’t face those demons and test ourselves? Three weeks ago, I wouldn’t have gone in a chairlift by myself; I wouldn’t have skied confidently down a blue run (yes, I am doing that now) and I wouldn’t have thought I could do 15 miles of skiing in one day. Sometimes, it’s worth the seemingly endless uphill battle to get to the top. To stop in the silence, breathe in the mountain air and gather yourself. To fill your lungs, straighten your skis and coast down the other side. Kim last ski day cruising the blues! Seeing Kim go through the challenges over the last few weeks brought about quite a bit of thinking on my part: after all to see someone you care about be this upset is not something you can ignore! As a coach, you try and learn how to help and support people, say the right things in the right way and encourage learning through experience. As a husband and someone you are sharing a motor home with, best to leave it to the professional ski instructor and be there to support and encourage when needed! I thought a lot about what Kim was going through. We are both wired differently so to see her panic and be upset the way she did on the slopes wasn’t something I could relate to there and then, however put me in a crowded bar with an Irish band getting everyone geed up and lots of drunk people jumping around and I can start to relate to the panic mode. You will find me out of there like a rat up a drain pipe and possible curled up in the motor home with the dog rocking back and forth. We learned a lot out there and not just about skiing but also about fears, learning new or improving existing skills and disciplines, the challenges and how to over come these in our own ways. As Kim was beginning her skiing journey I was re-visiting mine. After a 20 year break and some snow boarding trips I was inspired to think that Ski touring and mountaineering could be something I would like to do and possibly more later in life, so this was an opportunity for me to start that journey. But first I had to remember how to ski! This didn’t go too badly and I surprised myself how much I picked it back up. I certainly erred on the side of caution, having sustained a compressed spine twice through separate ski/boarding holidays in the past – one through actual snow boarding; the other from drinking a lot of vodka and jumping off a balcony 20ft above an ice ring. It didn’t hurt until the next day..
After a few days I was back in the groove and decided I was back in the comfort zone so needed to step things up a notch. Tip toeing up to the very steep red run at the top of the Pleney, I stopped on the edge to peer over. Having viewed from the comfort of the cable car many others sliding and scraping their way down – partners clearly leading their less confident other halves down, only for them to stutter and then slide spread-eagled down the icy face – I thought yep, this is the one. After a little bit of messing about on the edge I heaved myself over and into a turn, skis sliding down sideways on the ice, legs wobbling all over the place and me wondering why I hadn’t stuck to those nice cruisey blues! After some very messy turns and stops I managed to get down, feeling shocked at how much harder it was than I thought it would be, damn maybe I haven`t quite mastered it as well as I thought! After an afternoon of this I had a bit of re-focus and word with myself – why was it so much harder and why were other people making it look so much easier!? What did I need to do to allow me to ski like the locals? A few things came to mind and some others I discovered along the way. Watching the good skiers, seeing how they moved, where they put their weight, what they did with their poles, how they moved their knees – we can learn so much from just watching people. Practice – often goes without saying but yes practicing the basics and practicing doing them well rather than sloppily. So I made sure I did some of that. If you carry out a movement correctly 1000 times your body performs the movement exactly and subconsciously even when under much more load, stress or fatigue. More speed! Well probably not but I did try applying that. It certainly allowed me to get away with things when they went wrong, but I did find it also masked my poor technique which was very much highlighted in any sort of powder. Get some professional help – In addition to Kim I had the opportunity to have some lesson time with a great guy called Billy (Billski.co.uk) although we didn’t have too long, the things he taught me were exactly what I needed to take things up a notch. He also took me and Eddie on an epic ski session, down some great off piste runs I would never had ventured on without him and his local knowledge, which brings me to my next one. Go steeper and harder! Doing sections that scared the crap out of me made the ones that scared me a bit less seem so much easier! I kept taking on harder and harder runs, each time getting a bit better on those, but going back to the ones I found challenging earlier now seemed so much easier! Find your flow, find you rhythm and dont stop, once you get in the groove don“t think about it, just keep going and savour the feeling, the more you do this the easier it is to reconnect, it is really hard to explain what this feels like, but you will know once you are there, everything feels so much easier, you have given over to your subconscious and you are jut along for the ride! By the end of the trip I was quite happily launching off the top of the Pleney, now the challenge had become getting down with as few turns as possible – Kim mentioned a T shirt that said “every turn is a sign of fear!” ha ha! Jayson sking not a s fast as he thought he was! 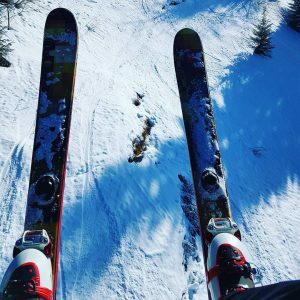 Love this article…you could have been writing about me last year on my first skiing trip…back in the Alps in four weeks, hoping for less fear and more fun. I don’t think I will ever see past a blue run though. Like you no race or distance scares when running. Well done you. Kim, I’m inspired that you conquered your fear to be able to enjoy skiing by the end of your holiday. I’m the total opposite to this – back in the day I lived in Aspen and was a ski instructor. When I was on the mountains surrounded by snow – or ice – and fuelled by adrenalin I felt no fear, despite being terrified of heights (but like Jayson before this holiday, I haven’t been on skis for years now). 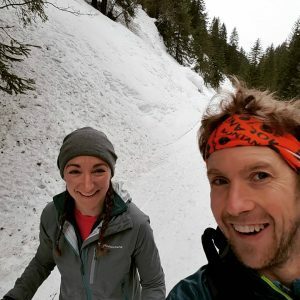 Lots of good advice applicable to running as well as to skiing!